Gun violence against members of Congress, relentless personal invective from the US president, harassment of public officials, and now, multiple suspicious packages, some with explosives, targeting high-profile Democrats. 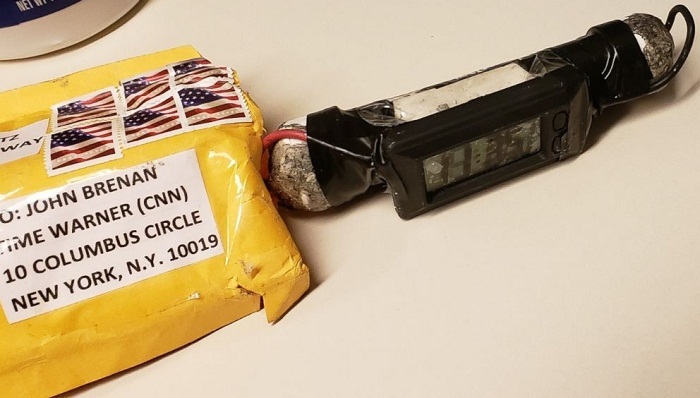 With 12 days before hugely consequential midterm elections, US authorities have foiled mail bomb attacks against former president Barack Obama, President Donald Trump's 2016 rival Hillary Clinton, Hollywood star Robert de Niro, news giant CNN and others. Washington, and much of America, has been subjected to an increasingly toxic political climate. Who and what is to blame? American politics has been clogged with nastiness for 200 years -- four presidents were assassinated, after all. The Vietnam War and Watergate were flashpoints. Federal buildings have been bombed. Experts point to the 1990s as a modern-day marker, notably Bill Clinton's tumultuous eight-year presidency. "The impeachment of Bill Clinton while he was in the White House and what the Republicans did at that point really I think created this very, very vicious cycle that we are now in," Anita McBride, an assistant to president George W. Bush who is now an executive-in-residence at American University, told AFP. Adding to the toxicity: the controversial 2000 election recount that led to George W. Bush's presidency, and his post-9/11 Middle East incursions. Far from producing a post-racial America, Obama's presidency enflamed racial tensions. Trump cynically seized the moment, spreading the "birther" lie that Obama was born in Kenya. A Democratic congresswoman was shot in 2011, and while lawmakers united in the aftermath, the partisanship grew. "The political climate frankly in the country has really been deteriorating for some time... and I think even well before the 2016 election, although it was heightened in that period and going forward," McBride said. The political temperature soared in the three years since Trump announced his candidacy. "Trump bears much of the blame for the current climate," stated John Pitney, professor of American politics at Claremont McKenna College, adding that the brash billionaire "lives on the dark side" of the rhetorical line. As president he persistently harangues opponents ("Pocahontas" is his ethnic slur for Senator Elizabeth Warren), and uses dog-whistle language to energize his base. He has praised supporters who get violent at rallies, failed to swiftly condemn neo-Nazis who killed a counter-protester in Charlottesville in 2017, and calls journalists the "enemy of the people." When supporters chant "Lock her up!" about Clinton, Trump grins. Hollywood figures are also regularly the target of the president's barbs but often bite back, as when De Niro denounced Trump in an expletive-laden Tony Awards speech earlier this year. "Time and time again, the President has condoned physical violence and divided Americans with his words and his actions," Democratic leaders in Congress said Wednesday in a statement. With the midterms approaching, Trump's demagoguery has swelled, as he warned about "mobs" of Democrats and retweeted a Republican congressman saying, with no evidence, that philanthropist George Soros was funding a caravan of migrants bound for the US border. Some experts say Trump's influence on the caustic atmosphere is overblown. "He may be more of a symptom of the problem than its cause," associate professor Timothy Hagle of the University of Iowa said. Others say the blame starts with the president. "Words matter, particularly when they're spoken by those at the top of government," Republican Senator Jeff Flake told CNN, adding Trump should dial down his rhetoric. "People hear that and they follow it." Some Democrats have urged aggressive action against Trump and his team. California congresswoman Maxine Waters -- one of the targets of the mail bomb attacks, framed by Trump as a "low IQ person" -- told supporters in June to "push back" on cabinet officials dining or shopping in public. Former CIA director John Brennan called Trump's behavior alongside Russian counterpart Vladimir Putin this year "nothing short of treasonous," outraging the White House. Brennan was also among those threatened with suspicious packages. Obama's attorney general Eric Holder this month urged more forceful opposition to Republicans, saying "when they go low, we kick 'em." Trump hit back days later, telling Fox, "He better be careful what he's wishing for." A suspicious package to Holder was intercepted Wednesday. Gruesome violence has also erupted. Last year a man who worked for Bernie Sanders' 2016 presidential campaign opened fire on congressional Republicans, gravely wounding Representative Steve Scalise. Clinton herself stoked tensions this month when she said "civility can start again" when Democrats regain control of Congress. "There are too many Democratic politicians that are actively encouraging this," Republican Senator Ted Cruz told NBC. The jury is still out. November 6 is days away, and Republicans are struggling to hold their congressional majorities. Trump, aiming to galvanize his base, is raising the alarm about the caravan. But the mail bombs pose a new conundrum. Conservatives in Trump's camp were already suggesting publicly that the mail bombs were part of a Democratic conspiracy to gain sympathy votes.